Roger Eschbacher Books and Other Writing: Time for the 7D! 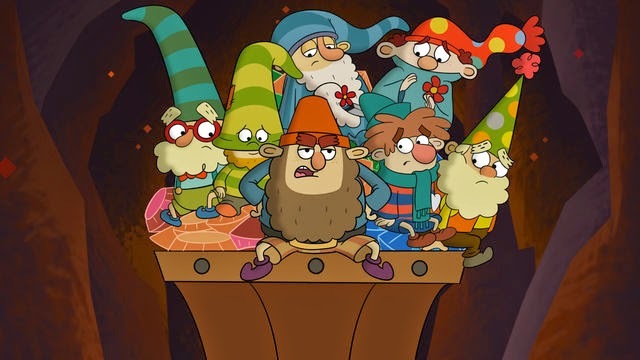 The 7D, a fun little show I wrote for last year, premieres this coming Monday (7/7) on Disney XD. "The series takes place in the whimsical world of Jollywood, where Queen Delightful relies on the 7D – Happy, Bashful, Sleepy, Sneezy, Dopey, Grumpy and Doc – to keep the kingdom in order. Standing in their way are two laughably evil villains, Grim and Hildy Gloom, who plot to take over the kingdom by stealing the magical jewels in the 7D’s mine. With seven very distinct personalities, the 7D always manage to save the day and send Grim and Hildy running back to their evil lair to try another day."